Galaxy medals feature a 3 dimensional scene framed by a unique modern border of a star and wreath design cut out. The back of the medal can be engraved to personalize for your event or team members. Galaxy Medals are available in gold, silver and bronze. A black, gold and silver flame serves as a back drop and frames a football runner on this football ignite resin. Simply add a personalized plate and this modern award design is ready to go to recognize your players who are burning up the football field. Acknowledge the star performers on your team with this sleek, modern resin design. The gold and black perpetual stars serve as a back drop for a full color football. Attached to a black base that has plenty of room too add a personalized plate, the Infinity Star is an award that fits any budget. 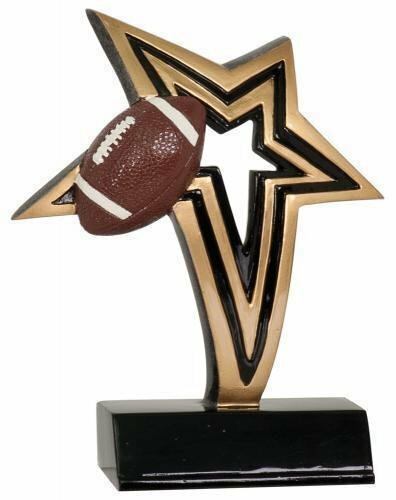 The star on this football award is leading the victory dance to celebrate a top notch performance on the football field. Just add a plate to the base to personalize it for your star performers and this award is ready for your event or awards ceremony. This Football award is a memorable keepsake that will be cherished by the recipient for years to come. 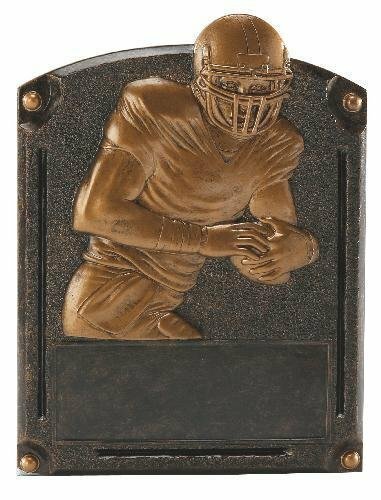 A football player is depicted with the ball tucked firmly under his arm and looking to score the winning touchdown while the unique bronze color finish makes this award something special. This Legend of Fame award measures 6 1/2 X 5 and also comes in a larger size, 8 X 6. A large area at the bottom of the award can accommodate all of your personalization needs. This item can either be hung on a wall or placed on a desk using the included stand. A silver and gold star backs this adorable, comical character with a football head and goofy expression. 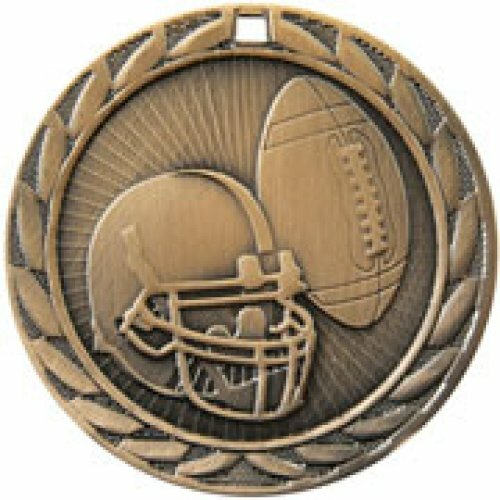 Add a plate personalized for your event to the 5" Little Pals Football Resin, and this modern, budget friendly award is perfect, especially for the younger athletes, but great for any age. This Football Live Action award has many unique features that set it apart. 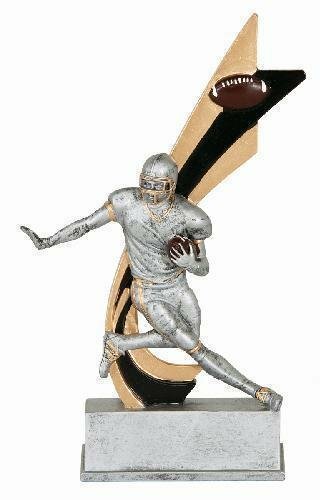 Boasting a football player with his hand out stretched to ward off defenders while cradling the football in the other hand all set against a gold and black tone action ribbon gives the award a dynamic look. A brown football with detailed white finger lacing completes the look. This award stands 8" tall and has plenty of engraving area on the base to accommodate your personalization needs. The gold and pewter finish highlights this award, making this the perfect football award.